What would Steve Jobs think? When you’re getting a little bored of looking at the same old home screen, the DreamBoard app for iOS can completely revamp your device with a whole new look. 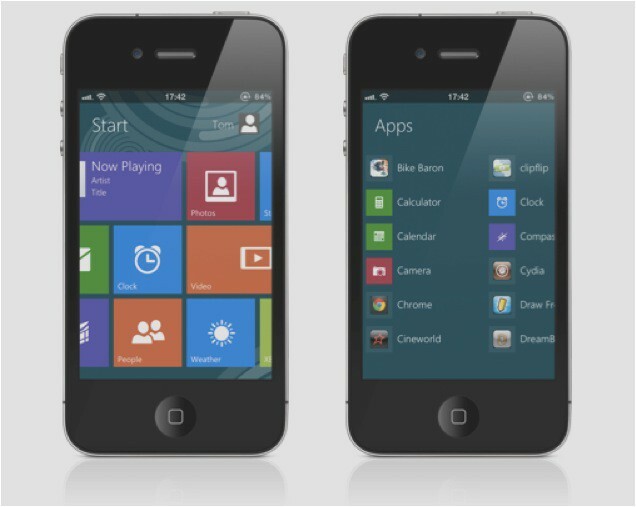 Couple that with a new tweak called Metroon and you have yourself an iPhone that runs Windows 8 (well… almost) — complete with a Metro user interface, live tiles, and even the “Charms” bar. The tweak supports jailbroken iPhones and iPod touches (not the iPad, unfortunately), and because it works with DreamBoard, installation is as downloading Metroon and hitting apply. Once you’re inside, the theme provides an incredibly accurate replica of Microsoft’s Metro interface in Windows 8. The theme comes with Windows-style notifications; a Windows Phone-esque lock screen with music controls, notification alerts, and the swipe up to unlock feature; a home screen complete with live tiles for things like Mail and the Music app; plus a Charms bar that appears when you swipe from the right-hand side of the display, which provides access to the theme’s settings, allows you to switch between the Metroon theme and regular iOS, and more. Inside the settings menu, you can customize the theme’s color scheme, backgrounds, and notifications. Metroon is a $1.50 tweak that is available to download from the Cydia Store now. Don’t forget, you will also need DreamBoard if you don’t already have it.